Boone County Clerk of the District Court office was moved last Friday, Feb. 20, into the former commissioners’ meeting room at the east end of the courthouse. Voters decided in the 2012 election to consolidate the District Court Clerk’s office with the County Clerk’s office. The consolidation was effective in January, and the district court office was moved to make it more available for staff. 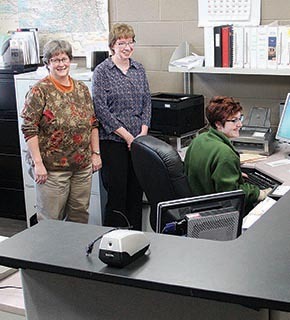 Shown in the new office space Monday are (l.-r.) Deputy Clerk Lorrie Nicklassen, County Clerk Kathy Thorberg and office assistant Sarah Robinson. 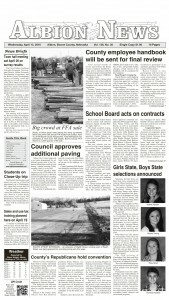 Commissioners were to decide at a meeting Feb. 25, on a new location for their meeting room.